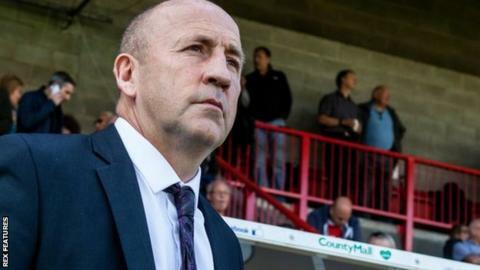 September's League Two manager of the month John Coleman says the award is merely recognition for Accrington Stanley's success as a club. Coleman received the award after Stanley won four and drew one of the five league games throughout the month. However, he was keen to highlight the contribution of his staff and in particular the playing personnel. "It's a team effort and a good compliment," 52-year-old Coleman told BBC Radio Lancashire. "I wouldn't mind winning it a few more times this season because that means we'd probably be a cert for the play-offs." The run of form has lifted the Crown Ground club into the play-off places after 11 games, despite last Saturday's 3-1 home defeat by Oxford which ended their unbeaten streak. "[Burnley boss] Sean Dyche last year made a salient point, you get manager of the month - or team of the month let's be honest about it - because the team has been on a good run," he said. "But it means that has to end sooner or later and that generally ends when you get awarded MotM, because you've been on such a good run. "I don't dress anything up on that, it doesn't affect me one way or the other, but the last time I got recognition like that we won the league so hopefully it's an omen." Midfielder Matt Crooks missed out on the players' award despite goals in his last three outings. "We knew he had potential, that's why we signed him and he's starting to deliver on that now," Coleman continued. "He'll only get better, the more he plays and gets exposed to it, the better he'll get. When he's on song it's frightening to think he's playing for us."